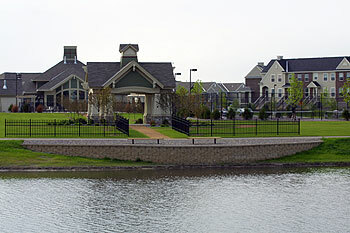 Formerly a 300-acre sod field along hwy 65 in Blaine, it is now a new community of over 1,100 homes that flourish with life. Enebak Construction Company began to work on concept plans in 1998. This site posed many challenges that were overcome by Enebak. The natural lay of the ground had over 20 feet of soft organic peat, which had to be removed and replaced with load bearing material to support the homes and streets. Adding to this challenge, the ground water table was just below the surface. Nearly 3,000,000 cubic yards of sand and peat were dewatered and moved to make this project a reality. Several lakes have been created during construction, some of which are in excess of forty feet in depth. They are a great amenity to this project, and the waterfowl really like them too.